Crownstone | Thermostats and energy labels fail! Saving energy is nice for the environment, but can also be nice for your wallet. One of the interesting measures taken by banks is to reduce your mortgage interest rate if you take green measures. This means your monthly costs go down by both saving energy and paying less interest. More contested in the Netherlands is the so-called energy label. Tias says it helps. De Rekenkamer says it doesn’t have much effect. EnergieOverheid says it’s just because energy systems are new that they are worth more. Interesting in this debate is that there seems to be much more consensus on the increased value of home automation when selling your home (compared to energy technology). You can find statements towards that effect by - obviously biased - home automation manufacturers (One Smart Control), but also more generally in the real estate world. In the Netherlands we have several consumer shows on television that check claims by manufacturers, check the origin of products, or otherwise try to inform the consumer. The Keuringsdienst van Waarde is one of these shows. Interesting note, Teun (Tony) van de Keuken, one of the investigators if this show, started his chocolate branch Tony’s Chocolonely after discovering that there is a lot of slavery and child labor in this industry. Another show is Kassa, which reports on undesired calls, roaming costs, safety of devices, and all kind of issues interesting to consumers. Interesting for our case, Kassa also reported on smart thermostats! Kassa tells us that the thermostat itself doesn’t really save energy! One of the features that would really make a difference is the ability of heating up separate rooms. That’s exactly what these thermostats don’t offer! This doesn’t mean that there are no products for zoned heating in the market. One of the products that can do this is the Honeywell Evohome. The above video shows the installation of Honeywell Evohome by Rutger Middendorp in his own home. Rutger is from Bright. At Crownstone we can take this one step further! If we extend our indoor localization service to heating, we would be able to only heat the rooms where we will be present. In this way people will not only save on the electricity bill, but also on the heating bill. This especially works well for people who do not mind if the heating turns on at the moment when they enter a room (e.g. when biking home you might be warm enough that you don’t mind that it takes some time before the living room is heated up). For other people some prediction will be necessary. Heat up the living room half an hour before you come home or heat up the bedroom before the typical time you go to bed. Not very easy to do, but also no rocket science. To integrate on a low level with the Crownstone network, it is convenient to use Bluetooth Low Energy thermostatic radiator valves. Please contact us or up vote if you think this would be nice for your situation! Bluetooth has a particular organisation that oversees the Bluetooth standard, the Bluetooth SIG group. This interest group can be compared to the Wi-Fi Alliance. Interesting to know is that these groups will probably be competing with each other soon. Did you hear for example about the Wi-Fi HaLow standard? 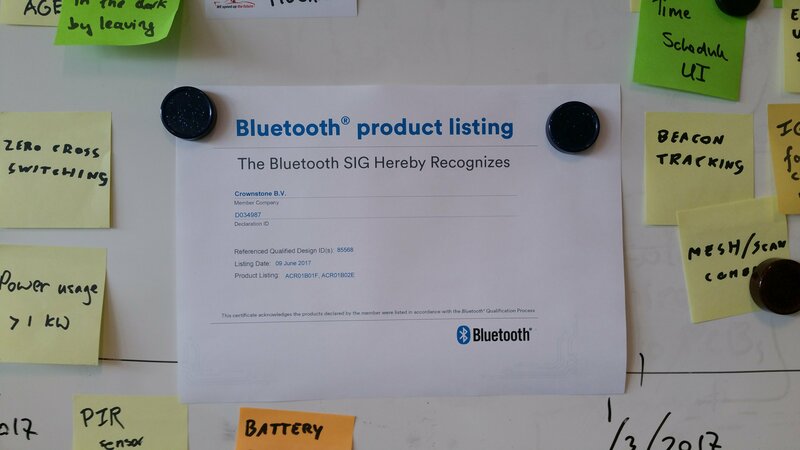 Our products are now officially listed and Bluetooth certified! The Crownstone app will get a nice new update in the next sprint. You’ll see it appearing automatically (we are rolling out first for a few people). Apart from that we are currently demoed in the Mediamarkt in Eindhoven in the cool Hypebox device. This is a box that allows you to display movies while showcasing a product by making the content transparent at strategic times. Everywhere where you see white, the video is see-through. A very nice effect! If you’re in Eindhoven, pay a visit to their Innovation Lab.